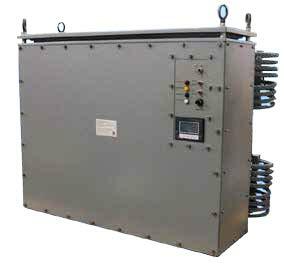 Espey designed and manufactures this battery charger and control system consisting of a charger assembly and a battery rack assembly. This system provides starting power and control systems power to a shipboard Emergency Diesel Generator (EDG). In addition, the charger assembly also provides conditioned 24 VDC to the EDG Auxiliary Logic Controller during “normal power” as well as emergency situations.